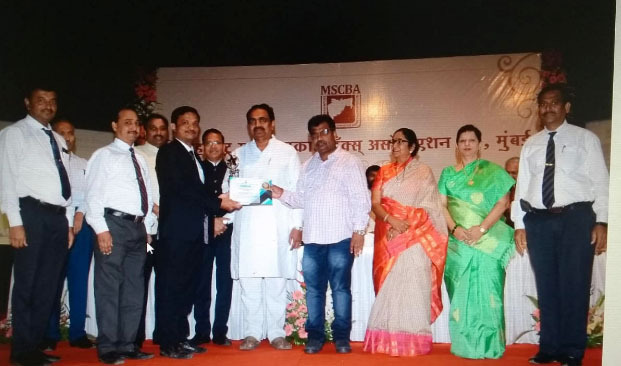 Jalgaon Janata Sahakari Bank General Manager Sunil Agrawal has been adjudged as the best manager recently in a function in Mumbai. Agrawal was awarded in the category of Best Manager by the Maharashtra State Cooperative Banks Association. Bank Chairman Anil Rao, CEO Pundalik Patil and several directors of the UCB congratulated Agrawal for achieving this prestigious award. The Awards were given jointly by Nationalist Congress Party state president Jayantrao Patil and by Vice-Chairman of Maharashtra State Cooperative Banks Association Vasant Ghuikhedkar. Those present included Chief Executive Officer Swati Pande, among others. Jalgaon Janata Sahakari Bank was established in 1979 and was the first bank that acquired the Scheduled status in the North Maharashtra region in 2001. It has a business mix of about Rs 2200 crore and a network of over 39 branches across the state. The Bank has earned a net profit of Rs 11.04 crore in the last financial year 2017-18.